Three years after the Paris Agreement was struck, we now finally know the rules – or most of them, at least – for its implementation. Much now hinges on the UN General Assembly summit in September 2019, to bring the much-needed political momentum towards a new raft of pledges in 2020 that are actually in line with the scientific reality. A key element of the Paris Agreement is the Global Stocktake – a five-yearly assessment of whether countries are collectively on track to meet the Paris Agreement’s goals to limit global warming. This raises concerns that the rulebook will ensure we know if we are falling behind on climate action, but will offer no prescription for fixing things. This risks failing to address one of the biggest issues with the Paris Agreement so far: that countries are under no obligation to ensure their climate pledges are in line with the overall goals. A successful, ambitious and prescriptive five-yearly review process will be essential to get the world on track. One of the aims of the Katowice talks was to develop a common set of formats and schedules for countries to report their climate policy progress. However, given the “bottom-up” nature of the Paris Agreement, countries are largely able to determine their own accounting rules, with guidelines agreed on what information they should provide. But a future international carbon trading market will obviously require a standardised set of rules. The newly agreed rulebook carries a substantial risk of double-counting where countries could potentially count overseas emissions reductions towards their own target, even if another country has also claimed this reduction for itself. Accounting rules for action in the land sector have also been difficult to agree. Countries such as Brazil and some African nations sought to avoid an agreement on this issue, while others, such as Australia, New Zealand and the European Union, prefer to continue existing rules that have delivered windfall credits to these countries. The Paris Agreement delivered the blueprint for a global response to climate change. Now, the Paris Rulebook lays out a structure for reporting and understanding the climate action of all countries. But the world is far from on track to achieving the goals of the Paris Agreement. The latest report from the UN Environment Programme suggests existing climate targets would need to be increased “around fivefold” for a chance of limiting warming to 1.5℃. The newly agreed rules don’t offer a way to put us on this trajectory. Multilateral climate policy has perhaps taken us as far as it can – it is now time for action at the national level. Australia, as a country with very high per-capita emissions, needs to step up to a leadership position and take on our fair share of the global response. This means making a 60% emissions cut by 2030, as outlined by the Climate Change Authority in 2015. Such an ambitious pledge from Australia and other leading nations would galvanise the international climate talks in 2020. What the world urgently needs is a race to the top, rather than the current jockeying for position. Australia’s energy emissions fell slightly due to renewable energy, but it’s not enough. While Australia is coming to terms with yet another new prime minister, one thing that hasn’t changed is the emissions data: Australia’s greenhouse gas emissions are not projected to fall any further without new policies. Australia, as a signatory to the Paris Agreement on climate change, has committed to reduce its total emissions to 26-28% below 2005 levels by 2030, and reach net zero emissions by 2050. New analysis by ClimateWorks Australia has found Australia has three times the potential needed to reach the federal government’s current 2030 target, but this will not be achieved under current policy settings. Australia’s emissions were actually falling for more than half a decade, but have been steadily increasing again since 2013. If Australia sustained the rate of emissions reduction we achieved between 2005 and 2013, we could meet the government’s 2030 target. But progress has stalled in most sectors, and reversed overall. Emissions are still above 2005 levels in the industry, buildings and transport sectors, and only 3% below in the electricity sector. It is mainly because of land sector emissions savings that overall Australia’s emissions are on track to meet its 2020 target, and are currently 11% below 2005 levels. Despite the current focus on the energy market, electricity emissions comprise about one-third of Australia’s total greenhouse emissions. So no matter what policies are proposed for electricity, other policies will be needed for the other major sectors of industry, buildings, transport and land. Fortunately, Australia is blessed with opportunities for more emissions reductions in all sectors. ClimateWorks’ analysis assessed Australia’s progress on reducing emissions at the halfway point from the 2005 base year to 2030, looking across the whole of the economy as well as at key sectors. We found emissions reductions since 2005 have been led by reduced land clearing and increased forestation, as well as energy efficiency and a slight reduction in power emissions as more renewable energy has entered the market. But while total emissions reduced at an economy-wide level, and in some sectors at certain times, none of the sectors improved consistently at the rate needed to achieve the Paris climate targets. Interestingly, some sub-sectors were on track for some of the time. Non-energy emissions from industry and the land sector were both improving at a rate consistent with a net zero emissions pathway for around five years. The buildings sector energy efficiency and electricity for some years improved at more than half the rate of a net zero emissions pathway. These rates have all declined since 2014 (electricity resumed its rate of improvement again in 2016). Looking forward to 2030, we studied what would happen to emissions under current policies and those in development, including the government’s original version of the National Energy Guarantee with a 26% emission target for the National Electricity Market. Our analysis shows emissions reductions would be led by a further shift to cleaner electricity and energy efficiency improvements in buildings and transport, but that this would be offset by population and economic growth. As a result, emissions reductions are projected to stagnate at just 11% below 2005 levels by 2030. Australia needs to double its emissions reduction progress to achieve the federal government’s 2030 target and triple its progress in order to reach net zero emissions by 2050. So, while Australia is not currently on track to meet 2030 target, our analysis found it is still possible to get there. What is a pre-industrial climate and why does it matter? The gap to the 2030 target could be more than covered by further potential for emissions reductions in the land sector alone, or almost be covered by the further potential in the electricity sector alone, or by the potential in the industry, buildings and transport sectors combined. Harnessing all sectors’ potential would put us back on track for the longer-term Paris Agreement goal of net zero emissions. Essentially this involves increasing renewables and phasing out coal in the electricity sector; increasing energy efficiency and switching to low carbon fuels in industry; increasing standards in buildings; introducing vehicle emissions standards and shifting to electricity and low carbon fuels in transport; and undertaking more revegetation or forestation in the land sector. The opportunities identified in each sector are the lowest-cost combination using proven technologies that achieve the Paris Agreement goal, while the economy continues to grow. In the next two years, countries around the world, including Australia, will be required to report on the progress of their Paris Agreement targets and present their plans for the goal of net zero emissions. With so much potential for reducing emissions across all sectors of the Australian economy, we can do more to support all sectors to get on track – there is more than enough opportunity, if we act on it in time. Tony Abbott has called for Australia to pull out of the Paris climate agreement, in a swingeing attack on Malcolm Turnbull’s National Energy Guarantee. Delivering the Bob Carter Commemorative Lecture in Melbourne, Abbott said: “Withdrawing from the Paris agreement that is driving the National Energy Guarantee would be the best way to keep prices down and employment up – and to save our party from a political legacy that could haunt us for the next decade at least”. Abbott played down the importance of the government’s much-vaunted tax cuts in comparison with the implications of energy policy. “These are strange times in Canberra when there’s a hullaballoo over modest tax cuts that only take effect fully in six or seven years’ time, while mandatory emissions cuts that start sooner, that mean more for the economy, and whose ramifications will be virtually impossible to reverse are expected more or less to be waved through”. In the party room last week Abbott had little support for his attack on the NEG. But his constant agitation is unhelpful for the government as it tries to win backing from the states and territories for the scheme. It also reinforces the impression of division in government ranks, even though the majority of the backbenchers now just want the energy policy settled. Abbott said that his government in 2015 had set a 2030 emissions reduction target “on the basis that this was more or less what could be achieved without new government programs and without new costs on the economy. ‘’There was no advice then to the effect that it would take a Clean Energy Target or a National Energy Guarantee to get there,” he said. “My government never put emissions reduction ahead of the wellbeing of families and the prosperity of industries”. When the world’s leading country exited the Paris agreement “it can hardly be business as usual,” he said. “Absent America, my government would not have signed up to the Paris treaty, certainly not with the current target”. Abbott said he could understand “the government would like to crack the so-called trilemma of keeping the lights on, getting power prices down and reducing emissions in line with our Paris targets – it’s just that there’s no plausible evidence all three can be done at the same time”. “If you read the National Energy Guarantee documentation, there’s a few lines about lower prices, a few pages about maintaining supply, and page after impenetrable page about reducing emissions. ’‘The government is kidding us when it says it’s all about reducing prices when there ’s an emissions reduction target plus a reliability target but no price target”. The government said it wanted to give certainty but the only certainty was that any NEG approved by state ALP governments at COAG would be “massively ramped up to deliver even more emissions reduction under the next Labor government”. Abbott repeated his call for the government to subsidise the boosting of baseload power. He again suggested threatening to compulsorily acquire Liddell coal-fired power station, which AGL is refusing either to keep going or to sell. One of China’s foremost environmental analysts recently explained to me that while for many years climate change was characterized as a western conspiracy to hold China back, it all changed around 2012. Overcoming China’s testiness about western imperialist designs and bringing China into the international climate tent may in future be seen as one of President Obama’s lasting legacies. When President Xi Jinping took charge in late 2012 he soon launched an ‘energy revolution’. He took up the call for an ‘ecological civilization’ and sent a message that coal would no longer be favoured. Provincial governments, which had resisted Beijing’s dictats to reduce coal use, began to be brought into line. As Xi accumulated more power, by marginalizing his enemies or having them arrested for corruption, it became increasingly risky to mess with Beijing. But the provinces too are shifting away from their GDP obsession to a greater emphasis on quality of life. The first phase of China’s national carbon market is expected to get under way this year. The Paris agreement and Xi’s constructive role in it greatly enhanced the influence of China’s environment ministry in bureaucratic tussles. Paris is now a powerful card to play, and incorporating environmental governance into policy has become the ‘new normal’. Coal use has now topped out in China, and total emissions are expected to peak around 2022-23, well ahead of the committed date of 2030 under the Paris Agreement. Unlike the United States, China takes its Intended Nationally Determined Contribution under the Paris accord very seriously. Beijing has a number of motives for taking an aggressive approach to carbon emissions. The headline one is social discontent due to appalling air pollution in the cities. Instead of closing coal-fired power stations, pollution levels could have been cut sharply by fitting scrubbers to them (as is done in the west), leaving carbon emissions untouched. But there are other reasons for cutting coal consumption. One is to undermine the power base of some of the most corrupt officials in the country, the bosses of the coal and electricity sectors. Unlike most of China’s leaders, Xi is no a technocrat, which helps. Beyond these domestic goals, the Party’s leadership can see a larger global dimension. Hastening China’s transition to low-carbon energy promises to give China ascendancy in the emerging renewable energy industries, industries set for massive expansion over the next decades as coal and oil combustion declines. Vast opportunities are available for the nation that manages to take the lead, and China is well on the way to doing so. This is why Trump’s decision is not just a serious set-back to global efforts to limit emissions but also damages US economic prospects. When US companies find they must go to China to buy their energy generation equipment they will understand that ‘America first’ means America loses. Some of them can see it already. At the highest level of strategy, Trump’s decision to ditch the Paris agreement presents Beijing with a golden opportunity to take on the mantle of global leadership. China has been slowly and systematically pursuing that role over some years by, for example, expanding its role in UN peace-keeping efforts. And it has been presenting itself as the new champion of global economic integration. President Xi’s speech at Davos in January, where he condemned protectionism and lauded the benefits of free trade and investment flows, was timed to contrast with the Trumpian retreat. The United States abandonment of the Trans-Pacific Partnership, which through more trade and investment would have strengthened US ties to East and Southeast Asia, left a hole for China to step into. The grand One Belt, One Road initiative is a pitch for global economic leadership that will grow as the United States shrinks into itself. Climate change presents China with the opportunity to acquire new legitimacy and respect as a world leader, offsetting the damage from its aggression in the South China Sea and escalating repression at home. Some analysts say that China is not yet ready to become the global leader, and displays a certain reluctance to seize the mantle. But faced with indecision and disorder in the west the Party leadership has often had to decide to grab a chance while it is there, or bide its time and take the risk that it will be much harder later. US withdrawal from global climate change leadership may be too good an opportunity to let pass. And there could be no better way for Beijing to demonstrate its claimed commitment to a peaceful and prosperous world than by directing the billions of dollars promised under the One Belt, One Road Initiative into low-carbon energy systems in developing countries. Developed countries too may find the lure of Chinese lucre too strong to resist and end up with energy infrastructures stamped ‘Made in China’. In the early 15th century the Ming Dynasty in China undertook a series of expensive oceangoing expeditions called the Treasure Voyages. Despite the voyages’ success, elements of the elite opposed them. “These voyages are bad, very bad,” we can imagine them tweeting. “They are a bad deal for China.” Eventually these inward-looking, isolationist leaders gained enough power to prevent future voyages. But this was an own goal. 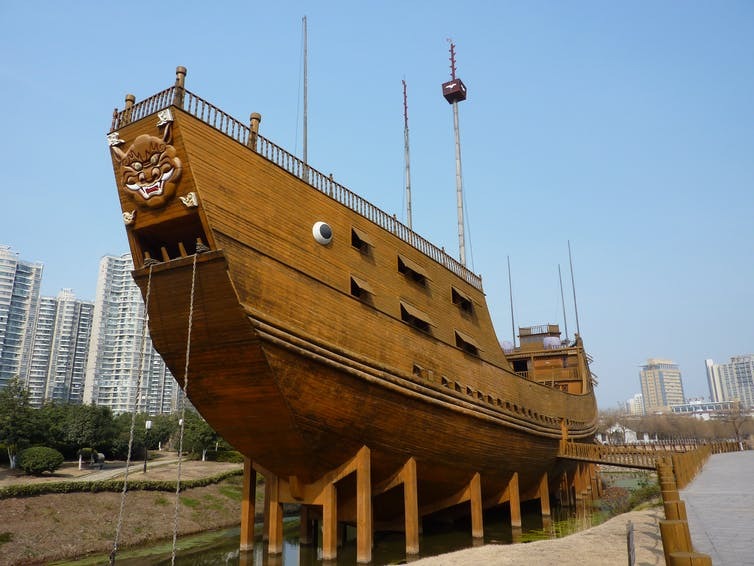 The parochial elites who killed off the Treasure Voyages could stop Chinese maritime innovation, but they could do nothing to prevent it elsewhere. Decades later, European sailors mastered the art of sailing vast distances across the ocean, and created fortunes and empires on the back of that technology (for better or worse). It is hard to see how China’s strategic interests were served by abandoning a field in which they led. There are some striking parallels in the Trump administration’s decision to renege on the Paris climate agreement. It has been cast as a move to protect America, but in the long run it won’t derail the world’s transition to a low-carbon economy, and instead the US will find itself lagging, not leading. Trump’s repudiation of the Paris deal is regrettable for at least three reasons. First, because the US is a technological leader whose entrepreneurs are extremely well placed to lead the global low-carbon transition; second, because America’s abdication of climate leadership weakens the global order and sends a wink and a nod to other fossil-fuelled recalcitrants like Saudi Arabia and Russia; and finally because having the world’s second-highest emitter outside the agreement is a clear negative. 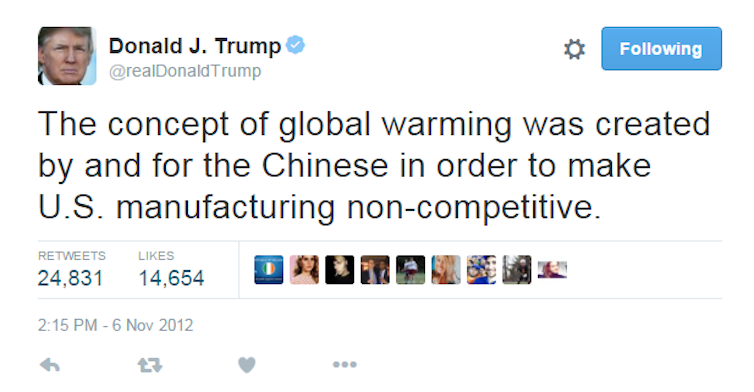 That said, US flip-flopping on climate is nothing new. The nation played a strong role in shaping the Kyoto Protocol, only to fail to ratify it. And while that did not help matters, it did not derail international efforts to combat climate change. In fact, the momentum behind climate-friendly initiatives has grown several-fold since the early 2000s. Viewed in the long run, the latest US defection changes little. Any conceivable future Democrat administration will rejoin the Paris Agreement. But more importantly, the transition to a low-carbon future is not dependent on the actions of a single player. The criteria for successful climate change policy are hard to achieve but easy to describe: success will come when non-emitting technologies economically outcompete fossil fuels, pretty much everywhere in the world, in the main half-dozen or so sectors that matter. A stable climate is what we call a “public good”, similar to fresh air or clean water. The US political scientist Scott Barrett has pointed out that climate change is an “aggregate efforts public good”, in the sense that everybody has to chip in to solve the problem of safeguarding the climate for everyone. “Aggregate efforts” public goods are especially hard to preserve, because there is a strong incentive to free-ride on the efforts of others, as the US now seeks to do. But technology can transform this situation, turning an aggregate efforts public good into a “best-shot public good”. This is a situation in which one player playing well can determine the whole outcome, and as such is a much easier problem to solve. We have seen technology play this role before, in other global environmental issues. The ozone hole looked like a hard problem, but became an easy one once an inexpensive, effective technological fix became available in the form of other gases to use in place of ozone-harming CFCs (ironically, however, the solution exacerbated global warming). Something similar happened with acid rain, caused by a handful of industrial pollutants. Dealing with carbon dioxide emissions is harder in view of the number of sources, but breakthroughs in five or six sectors could make a massive dent in emissions. This suggests that solving climate change relies far more heavily on technological innovation and successful entrepreneurship than it does on any single government. Policies in specific jurisdictions can speed climate policy up or slow it down, but as long as no single government can kill the spirit of entrepreneurship, then no country’s actions can alter the long-run outcome. This is why German climatologist John Schellnhuber is right to say that “if the US really chooses to leave the Paris agreement, the world will move on with building a clean and secure future”. The low-carbon race is still on, and the main effect of Trump’s decision is to put US innovators at a disadvantage relative to their international competitors. We have seen these technological races before, and we have seen what recalcitrance and isolationism can do. Just ask the Ming Dynasty, who ceded their maritime leadership and in doing so let Europe reap the spoils of colonialism for half a millennium. Similarly, the Trump administration can ignore basic physics if it likes, although this is electorally unsustainable – young Americans can see that it is in their own interest to support climate policy. Democracies are imperfect, but over time they have the ability to self-correct. Developing polices that regulate the release of environmentally damaging gases is important. Pricing carbon is important. But government policy is not everything. Ultimately, this problem will be solved mainly by technology, because the way out of the jam is by finding new, inexpensive ways for humans to flourish without harming the planet.